I figured that I would take a purely objective and mathematical look at the statement of the Noacian Delugue (the Great Flood). Not starting from any supposition of right or wrong on the story, I simply wished to check the forces at work in our flood story. I'm not even concerned with the feasability of collecting animals or fiting them in a boat, just the natural forces described. So here's the process. 1) Given: The stated flood covered all land on earth. 2) Given: the duration of the flood is stated at 40 24-hour periods. Well, that's a really big number, but the earth is pretty big as well, so lets get some more data. 4)To determine the force of the rain, I must first discover the rate of the rainfall. Once again, large large numbers, but this is still planetary scale. Now that we have the amount of rain falling at a given rate at a workable area on human scale we can get the force of the rain. A continuous 38.753 Newtons on every square meter of earth for 40 days is not rain, it is the equivalence of hydrological stripmining. With this much water, you would not end up with canyons and rifts, you would end up with everything not made of bedrock being eroded into the lowest basin zones on the earth. No topsoil would remain, no sandstone or limestone, granite formations would break apart at stress seams. You are also looking at a rise in water level by around 2.56 cm per second (1 inch per second). Any thing floating on top of this water would be pushed up into the rain, effectively increasing the force with which the rain hits the object by around a factor of 2. Given that I'm no geologist or mechanical engineer, I'm not sure of the effects on surface tension from this much rain, or currents and water turbulance. However, by my findings here I conclude that we should have none of the land masses we now know given a global flood of this magnitude. If anyone wishes to check my math, please do so. Also if there are any engineers that can give a better understanding of what 38.753 N per second for 40 days would imply mechanically, I'd love to know. In that kind of "rain", you would think that the ark would sustain some heavy damage. 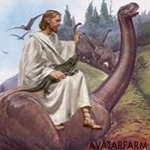 But then again, the ark was magical and therefore not affected. you could make a similar mathematical argument regarding the number of animals involved. The sheer number of animals required to fullfill "two of every species" result in all kinds of problems with feeding, housing, and cleaning up after that many animals for any amount of time. More importantly, you would be able to show that in order for Noah to actually gather all the animals (1.5 million species, estimating conservatively) he would have to move at Santa Claus-like speeds. Assuming he could gather 1 species per minute (that's being rather generous, given the distances he would have to travel), it would take nearly 3 full years, working non-stop. using a more realistic 1 hour per species (which is still extremely generous, given the travel methods available at the time) it would take 170 years to gather them all. This is exactly why asking whether someone literally believes in Noah's flood is a great way to start any religious conversation with a theist. It's a quick way to tell if someone is mentally retarded. Now if only there was a Hydrologist in the house, we could get a better view of the data I have. I was informed by a friend of mine who is a mechanical engineer that analyzing this as an impact is a little inaccurate. However he agrees that top soil and all sedimentary formations above sea level should be completely gone given the data. Anyone konw where I can find a hydrologist?